A few years ago I read an article in Relevant Magazine by Jason Boyett titled, “O Jesus, Who Art Thou?”  The article illustrated the cultural and ecclesial confusions related to the person of Jesus as proclaimed, embraced, and pursued by Western Christians. The article was somewhat sparked by the “Jesus is my homeboy” fad that inspired the mass production of over-priced retro t-shirts. While it was funny for a while, the trend and Relevant article offered important commentary that confronted the Christological schizophrenia plaguing the church and its members. Said differently, while we may laugh at the 45 million-plus images that appear within less than a second when Jesus is “Googled,” the church and Western Christianity is not all that different when the same search is pursued in our congregations. Yes- there is a plurality of truth. I agree- diversity is a gift to the church and Christian theology. Certainly we must not think for a second that any of our attestations to the person and work of Christ are complete and absolute. As Karl Barth said, all theology is modest theology. However, concern needs to surface when Jesus is cast in the image of pop-culture and oppressive and empirical narratives that have less to do with the biblical witness and everything to do with the free and consumer-driven market of the West. Even worse, red flags are to be waved when those within the church are both ignorant of and naïve to this idolatrous trend. • God wants people to be good, nice and fair to each other, as taught in the Bible and by most world religions. • The central goal of life is to be happy and feel good about yourself. • God is not involved in my life except when I need God to solve a problem. As should be evident, Jesus is nowhere to be found, “O Jesus, where art thou?" Furthermore, I also appreciate Dean’s strong conviction that the responsibility and, better said, fault, lay not solely in the spiritual habits or (im)maturity of Christian youth. Instead, the prominence of Moralistic Therapeutic Deism in the spiritual convictions of youth is more of a “moral indictment of American congregations.”  That is to say, we cannot expect the faith language and Christian theology of the Church’s youth to be formed faithfully aside from parallel adjustments made within the adult education programs and academies of the larger congregation and the incarnation of these truths in the life and witness of all of God's people. This is where I have particularly enjoyed the recent conversations had in my current seminary course with John Franke. With the aid of a white board, we more or less confessed the plethora of cultural images of Jesus that are touted by both individuals and Christian communities. The class then sifted the wheat from the chaff of these images in light of the biblical witness, seeking to recover some sort of redemptive truth from even the most heinous of Christologies. Finally, we were reminded that flexibility and grace must be embraced as God’s people engage theology as a “second-order discipline” that bears witness to versus claims possession of the Jesus illustrated within the pages of Scripture. This is cause for the Church to be an always-reforming community normed by the biblical witness, engaged with the diverse traditions of the faith, and conversant with contemporary culture, which can be both a help and hindrance to theological reflection. In this way, the church is further charged to move into its missional vocation that is to and for the whole world. However, unless the church engages in this honest sifting, guided by God's Spirit, its witness will be confused at best, oppressive at worst. Furthermore, without a willingness to be always reforming faith language, congregations will continue to mentor youth into a Christ-less faith and rob them of the joy found in a Christocentric gospel that spurs them into their baptismal vocation and Eucharistic mission in and for the world. In essence, it is possible for the Church to be efficient in the development of model American citizens yet fruitless in its call to make disciples. Boyett, Jason. "O Jesus, Who Art Thou?" Relevant Magazine. July/August 2005. pp. 40-43. Barth, Karl. Evangelical Theology: An Introduction. Translated by Grover Foley. Grand Rapids, MI: Eerdmans Publishing Co., 1963. p. 7. Brian McLaren's newest book, A New Kind of Christianity (2010) refers to common (mis)understandings and biblical hermenutics as manifestations of the ancient Greco-Roman narrative. 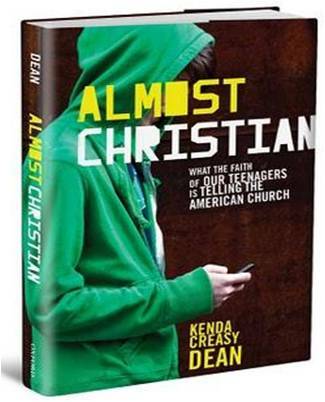 This comes from Kenda Creasy Dean's recent article, "Faith: Nice and Easy," published in Christian Century: http://www.christiancentury.org/article/2010-08/faith-nice-and-easy. 3 Aug 2010. I will defend youth to the grave on this point. Maybe I am bias, but I believe youth are some of the more creative, intuitive, and prophetic witnesses to the gospel. That's my little shout out to the Imago Dei Youth of WPC ;) The larger question remains in terms of the faith that is handed down to them from generation to generation. Also cited from article above.